SIX YEARS AGO, IN THE INTRODUCTION to a multidisciplinary CME publication on soft tissue fillers, I wrote of how progress in any field occurs as a composite process, from fresh discoveries as well as from updated interpretations of what is already known. Progress for fillers has been rapid since then, and science has played a catalytic role. Rheology, the study of flow-related characteristics, has revolutionised our thinking by providing a compelling scientific basis for the selection of filler products and injection techniques to optimise clinical outcomes. Concurrent advances in anatomical research have further strengthened this rationale. The purpose of this necessary paper is to introduce a model of scientific inquiry with potential to transform perceptions and usage of threads. The studies described below are the first investigations of key biomechanical properties for absorbable suspension threads, with an initial focus on threads composed of poly-L-lactic acid-co-ε-caprolactone (PLLA-co-PCL). PLLA-co-PCL threads typically last for at least one year, and they can be combined successfully with fillers, surgery and fat grafting. Comparative data for absorbable threads with other chemical compositions and structures will be presented and analysed statistically in a subsequent publication. Reports of threads being implanted beneath the skin to tighten the face date back to ancient Egypt and Asia. However, threads have polarised opinions in more modern times. 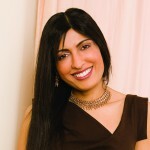 Advocates are attracted by their promise of facial lifting and tightening without scarring or prolonged recovery time. Detractors view them as an inadequate and short-lived substitute for surgery, or as a two-dimensional approach to three-dimensional manifestations of ageing that are more logically addressed by injectables. Training programmes are critiqued for prioritising the anecdotal ‘show and tell’ of before and after images over an evidence-based approach, and for lack of clarity regarding effects that are specifically attributable to threads when combined with fillers. From an evidence-based perspective, three primary unmet needs can be identified. First, it is important to define the appropriate indications for threads — the situations in which threads can make a tangible difference. The clinically relevant points of distinction between threads with different compositions and structures must also be determined. And, finally, it is critical to devise protocols that minimise complications, and manage them when they do occur. As with filler rheology, understanding accrued through scientific study can be leveraged to achieve consistent and predictable outcomes from threads. Figure 1. Microscopic Images of Poly-L-lactic acid-co-ε-caprolactone (PLLA-co-PCL) Threads. Stereomicroscopy was performed at magnifications of 6.7x (A), 20x (B) and 40x (C). PLLA-co-PCL 12 cm and 23.2 cm threads were both found to have notches that create periodic, bi-directional barbs along their lengths. The orientation of the barbs was specific to this particular type of PLLA-co-PCL thread [Definisse / Happy Lift]. Twenty specimens of absorbable polymeric PLLA-co-PCL suspension threads (Definisse/ Happy Lift Threads, Relife S.r.l., Florence, Italy) were investigated microscopically and rheologically in an independent laboratory testing facility. The tested threads, which are CE-marked, comprised 10 specimens of 12 cm in length and 10 specimens 23.2 cm in length. Optical microscopy was performed at four magnifications (6.7x, 10x, 20x and 40x) using an Olympus SZ61 stereomicroscope. Tensile Strength and Rheological Creep & Recovery were measured in a dynamic mechanical analysis device [RSA-G2, TA Instruments] that immobilised the threads between two tension fixture clamps. All testing was conducted at room temperature (25°C) and constant humidity. Mechanical strength was quantified by means of Tensile Strength testing. PLLA-co-PCL threads were suspended vertically between the tension fixture clamps and then subjected to a controlled, mono-axial stretching force via progressive elevation of one fixture clamp at a rate of 50 mm/minute while the other clamp remained in its original position. Tensile strain, which is inversely related to Tensile Strength and defined as the ratio of thread extension to original thread length, was computed by the dynamic mechanical analysis device until the point at which thread rupture occurred. Rheological Creep & Recovery testing was performed to assess the threads’ pattern and balance of elastic behaviour (ability to return to original length) and plastic behaviour (tendency to maintain residual elongation). Each PLLA-co- PCL thread was suspended vertically, a load of 4N was applied for 40 minutes and tensile strain was computed during this time period. The 4N load was then removed, leaving a residual small load (pre-load) of 0.05N due to the effect of gravity on the suspended thread. Computation of tensile strain continued for 80 minutes after load removal to determine how much recovery of plastic deformation occurred during this time period. Stereomicroscopic analysis showed that all specimens of PLLA-co-PCL 12 cm and 23.2 cm threads had notches that created periodic, bi-directional barbs along their lengths (Figures 1A–C). The orientation of the barbs was found to be specific to this particular type of PLLA-co-PCL thread. 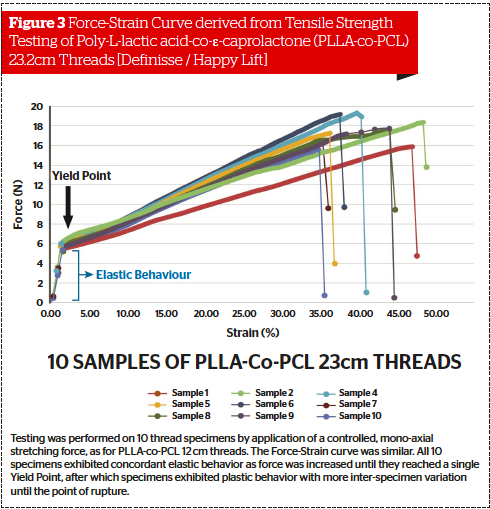 PLLA-co-PCL 12 cm and 23.2 cm threads behaved similarly during Tensile Strength and Rheological Creep & Recovery testing, with good repeatability when the 10 specimens of each length were evaluated. On Tensile Strength testing, threads displayed elastic behaviour with a progressively increasing tensile force up to a Yield Point, after which they displayed plastic behaviour until the point of rupture (Figures 2 and 3).During Rheological Creep & Recovery testing, PLLA-co-PCL 12 cm and 23.2 cm threads both showed an immediate elastic response to application of the 4N load, followed by a plastic deformation that increased constantly with time. 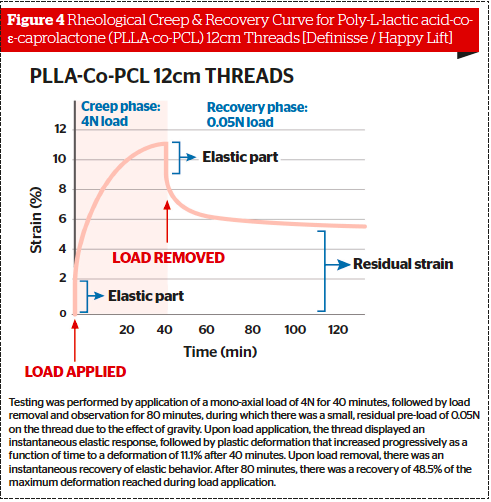 Forty minutes after load application, PLLA-co-PCL 12 cm threads had deformed by 11.1% and PLLA-co-PCL 23.2 cm threads by 10.5%. When the 4N load was removed, leaving only the 0.05N pre-load, all specimens showed an instantaneous recovery of elastic response, i.e. a reversal of plastic deformation. 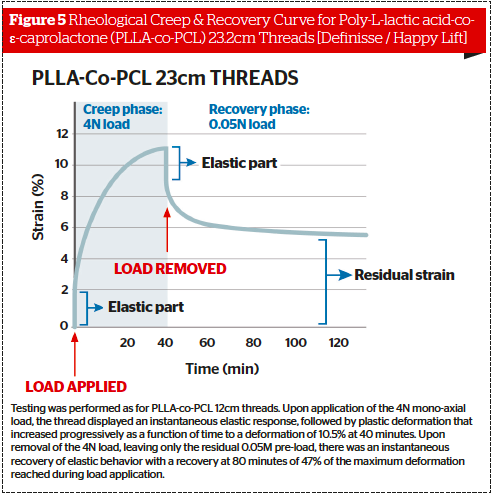 Eighty minutes after load removal, PLLA-co-PCL 12 cm threads had recovered 48.5% of the maximum deformation reached, and PLLA-co-PCL 23.2cm threads had recovered 47% (Figures 4 and 5). Based on these stereomicroscopic and rheologic investigations, absorbable polymeric PLLA-co-PCL 12 cm and 23.2 cm suspension threads demonstrate consistent structure and reproducible biomechanical behaviour. Forces applied to the threads during rheologic testing were considerably higher than would be anticipated after implantation into living, subcutaneous facial tissue. These supra-physiological stress conditions were selected to evaluate the threads’ ability to tolerate cumulative forces over their clinical lifespan due to cyclical contractions of facial muscles and gravitational effects. This is analogous to the subjection of cars to high‑stress testing conditions by their manufacturers, to ensure they are capable of withstanding the cumulative stresses of road life while maintaining high performance and safety.Tensile Strength and Rheological Creep & Recovery studies showed that PLLA-co-PCL 12 cm and 23.2 cm threads have a mechanical strength that is mid-range relative to all absorbable threads tested to date, and high relative to another type of PLLA-co-PCL thread (data will be presented in a subsequent publication). 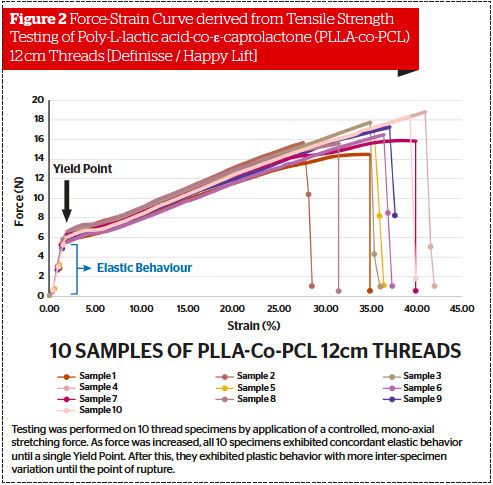 PLLA-co-PCL 12 cm and 23.2 cm threads demonstrated the ability to recover a significant component of elastic behaviour after stress testing, while maintaining some degree of plastic deformation. These findings support the selection of threads with specific biomechanical properties that are matched to each procedural application, in order to facilitate optimal outcomes. If the mechanical strength of a thread is too high for a given application, this may cause excessive thread tension and tissue traction which manifests as pain, inflammation and skin contour irregularities. If mechanical strength is too low, the results will be suboptimal due to insufficient tissue traction. The analogy with fillers is that an elastic modulus (G’) that is too high, indicating excessive gel firmness, carries a greater risk of nodules and other contour irregularities; whereas a filler with too low an elastic modulus will be too soft to deliver the requisite tissue lifting effects. In an aesthetic context, Rheological Creep, and the plastic deformation that it implies, can have benefits and disadvantages. It is known from studies of concrete, metal, and other materials used for building construction that Rheological Creep can occur as a result of long-term exposure to forces that remain below the Yield Point of the material. Too much Creep in a material can deform it to the extent that it is unable to function. However, moderate Creep can be desirable — as in the case of concrete, for which some degree of plastic deformation alleviates tensile forces that might otherwise lead to cracking and complete failure of support. The analogy with threads is that an ideal balance between elastic and plastic behaviour will generate sufficient tissue support while maintaining adaptability to the dynamic forces of facial movements. The unifying concept that emerges from these data is that a specific Biomechanical Profile can be devised for each type of thread based on its mechanical strength, balance of elasticity versus plasticity, and other key rheological parameters. The Biomechanical Profile allows data-driven selection of the appropriate type of thread and the technique with which it should be implanted to achieve specific clinical objectives. For each parameter within the Biomechanical Profile, a desired value, or ‘sweet spot’, can be conceptualised that is high enough to give the best results, but not so high that it causes complications. The striking parallels between biomechanical tailoring of threads and rheological tailoring of fillers broaden the scope of individualised treatment plans based on scientific discovery.ConclusionsScientific data empower full understanding of the capabilities of any aesthetic tool and formulation of the right strategies to harness these capabilities. 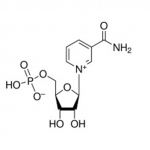 These first scientific studies of absorbable polymeric suspension threads provide valuable insights into the static and dynamic capabilities of one type, Poly-L-lactic acid-co-ε-caprolactone (PLLA-co-PCL), over their lifespan of one year or more. Key data can be incorporated into Biomechanical Profiles and integrated with anatomical understanding to guide appropriate thread selection and application. This promises an evolution from anecdotal use to evidence-based paradigms of tissue mobilisation and reshaping. If we wish threads to align with current volumetric and surgical thinking, their potential to restore three-dimensional facial support and physiological movement must be realised. A subsequent publication will present comparative Biomechanical Profiles for threads with different chemical compositions, expand the concept of biomechanical tailoring, and add clinical correlation. A newly-developed dynamic treatment model that effectively addresses all three anatomical dimensions — frontal, sagittal and transverse — can correct facial projection, width, and gravity-related ptosis respectively. This model can be applied to the combination of threads with surgery. 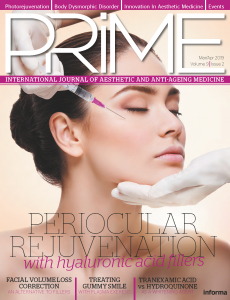 It is also applicable to the combination of threads with fillers to address emerging challenges — including restoration of three-dimensional support without midface over-volumisation or displacement of the lid-cheek junction.Acknowledgements The author thanks Dr. Henry Delmar, MD, Clinique Science & Beauté, Cap d’Antibes, France, for guidance on the clinical correlation of these data, and Ms. Vidya Srinivasan, Dermatology, Cosmetic & Laser Surgery, Fairfax, VA, USA for critical review of this manuscript. Support for these studies was provided by Relife S.r.l. Florence, Italy. Studies were performed independently at Il Sentiero International Campus, S.r.l., an accredited laboratory with a university-based ethics committee, located in Castelvetro di Modena, Italy. If we wish threads to align with current volumetric and surgical thinking, their potential to restore three-dimensional facial support and physiological movement must be realised. Abellan D, Nart J, Pascual A et al. Physical and Mechanical Evaluation of Five Suture Materials on Three Knot Configurations: An in Vitro Study. Polymers. 2016; 8(4):147-155. Albert A, Ricanek K, Patterson E. A review of the literature on the aging adult skull and face: Implications for forensic science research and applications. Forensic Sci Int. 2007;172:1–9. Coleman S, Grover R. The anatomy of the aging face: Volume loss and changes in 3-dimensional topography. Aesthet Surg J. 2006;26(Suppl):S4–S9. Cotofana S, Gotkin R, Ascher B et al. Calvarial volume loss and facial aging: A computed tomographic (CT)-based study. Aesthet Surg J. 2018;38(10):1043-1051. Farah S, Anderson D, Langer R. Physical and mechanical properties of PLA, and their functions in widespread applications — A comprehensive review. Adv Drug Rev. 2016;107:367-392. Hwang K, Kim H, Kim DJ et al. Superficial Fascia (SF) in the Cheek and Parotid Area: Histology and Magnetic Resonance Image (MRI). Aesth Plast Surg. 2016;40:566-577. Kablik J, Monheit G, Yu L et al. 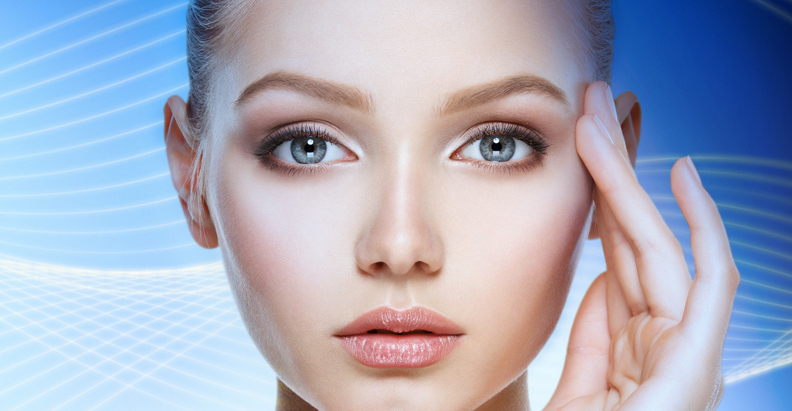 Comparative physical properties of hyaluronic acid dermal fillers. Dermatol Surg. 2009;35(Suppl 1):302–312. Kim SK, Hwang K. Anatomical Basis for “Superficial Flow Volumetry” and “Deep Support Volumetry”. Plast Reconstr Surg Glob Open. 2016;4(9):e860. Lambros V. Models of facial aging and implications for treatment. Clin Plast Surg. 2008;35:319–327; discussion 317. Lambros V. Observations on periorbital and midface aging. Plast Reconstr Surg. 2007;120:1367–1376; discussion 1377. Lambros V, Amos G. Three-dimensional facial averaging: A tool for understanding facial aging. Plast Reconstr Surg. 2016;138(6):980e-982e. Linden O, He JK, Morrison C. The Relationship between Age and Facial Asymmetry. Plast. Reconstr. Surg. 2018;142: 1145-1152. Mendelson B, Wong CH. Changes in the facial skeleton with aging: Implications and clinical applications in facial rejuvenation. Aesthetic Plast Surg. 2012;36:753–760. Pessa J, Zadoo V, Yuan C et al. Concertina effect and facial aging: Nonlinear aspects of youthfulness and skeletal remodeling, and why, perhaps, infants have jowls. Plast Reconstr Surg. 1999;103:635–644. Pessa J. An Algorithm of Facial Aging: Verification of Lambros’s Theory by Three-Dimensional Stereolithography, with Reference to the Pathogenesis of Midfacial Aging, Scleral Show, and the Lateral Suborbital Trough Deformity. Plast Reconstr Surg. 2000;106(2):479-88; discussion 489-90. Pierre S, Liew S, Bernardin A. Basics of dermal filler rheology. Dermatol Surg. 2015;41(Suppl 1):S120–S126. Pillai CK, Sharma CP. Review paper: absorbable polymeric surgical sutures: chemistry, production, properties, biodegradability, and performance. J Biomater Appl. 2010;25(4):291-366. Raspaldo H, Baspeyras M, Bellity P et al. ConsensusGroup. Upper- and mid-face anti-aging treatment and prevention using onabotulinumtoxin A: The 2010 multidisciplinary French consensus. Part 1. J Cosmet Dermatol. 2011;10:36–50. Raspaldo H, Niforos FR, Gassia V, et al. ; Consensus Group. Lower-face and neck antiaging treatment and prevention using onabotulinumtoxin A: The 2010 multidisciplinary French consensus. Part 2. J Cosmet Dermatol. 2011;10:131–149. Rohrich R, Pessa J. The fat compartments of the face: Anatomy and clinical implications for cosmetic surgery. Plast Reconstr Surg. 2007;119:2219–2227; discussion 2228–2231. Rohrich R, Pessa J, Ristow B.The youthful cheek and the deep medial fat compartment. Plast Reconstr Surg. 2008;121:2107–2112. Rohrich R, Arbique G, Wong C et al. The anatomy of suborbicularis fat: Implications for periorbital rejuvenation. Plast Reconstr Surg. 2009;124:946–951. Rohrich RJ, Pessa JE. The anatomy and clinical implications of perioral submuscular fat. Plast Reconstr Surg. 2009;124:266–271.8. Rohrich R, Pessa J. Discussion: Aging of the facial skeleton: Aesthetic implications and rejuvenation strategies. Plast Reconstr Surg. 2011;127:384–385. Schenck T, Konstantin C, Koban A et al. The Functional Anatomy of the Superficial Fat Compartments of the Face: A Detailed Imaging Study. Plast Reconstr Surg. 2018;141(6):1351-1359. Shaw R Jr, Katzel E, Koltz P et al. Aging of the mandible and its aesthetic implications. Plast Reconstr Surg. 2010;125:332–342. Silver FH. Biological Materials: Structure, Mechanical Properties and Modeling of Soft Tissues. New York: New York University Press; 1987:75–79. Sundaram H, Cassuto D. Biophysical characteristics of hyaluronic acid soft-tissue fillers and their relevance to aesthetic applications. Plast Reconstr Surg. 2013;132(Suppl 2):5S–21S. Sundaram H, Rohrich R, Liew S, et al. Cohesivity of hyaluronic acid fillers: Development and clinical implications of a novel assay, pilot validation with a five-point grading scale, and evaluation of six U.S. Food and Drug Administration-approved fillers. Plast Reconstr Surg. 2015;136:678–686. Sundaram H, Liew S, Signorini M et al. Global Aesthetics Consensus: Hyaluronic Acid Fillers and Botulinum ToxinType A—Recommendations for Combined Treatment and Optimizing Outcomes in Diverse Patient Populations. Plast. Reconstr. Surg. 2016;137:1410-1423.